Last week I came back from my much needed hot, sunny and delicious vacation in Greece. Living in the UK, you forget what real sunshine, heat and, more importantly, summer really feels like. As always, whenever I go home, my sister Z. and I always make time to cook a fun meal for our friends. This time around, as the temperatures were so high, we decided to invite the girls for a refreshing daytime pool party. (Those remaining in the deserted capital…) We tossed around ideas: light Greek meze-style, spicy and citrus-y Tex-Mex, refreshing Asian fusion. We decided on Asian Fusion, as I was going to be making dumplings for the Daring cooks challenge… Little did I know of what I was in for. 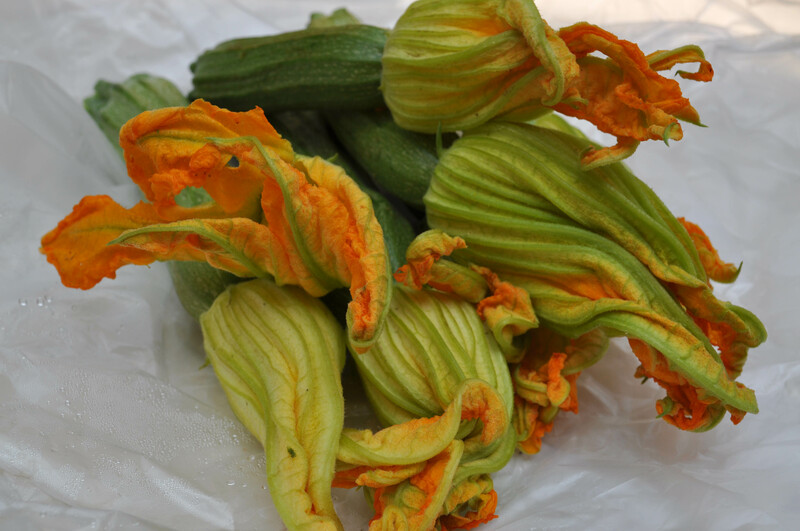 So, we set off for the super market, get everything we needed and I also got some beautiful zucchini blossoms, because I had been dying to cook with them. Z was in charge of the sticky chicken wings. Shortly after contemplating whether she should follow the printed recipe, she closed the book and decided to disregard it completely and wing it(dorky pun, I know… couldn’t help myself! hehe). So she was off seasoning and flavoring to her heart’s content. Meanwhile, there’s me in the other corner… Slaving over the stove trying to make the dough for dumplings wrappers using tapioca flour. I did not do research my research, to know that tapioca flour turns only into balls of gelatin, or, in my case, one giant block of gelatin… Which when attempted to be made into a flat disk just made a huge slimy mess on the counter that was impossible to remove. (This is after 50 minutes of struggling) So at this point, I decide to reroute and cut my loses. 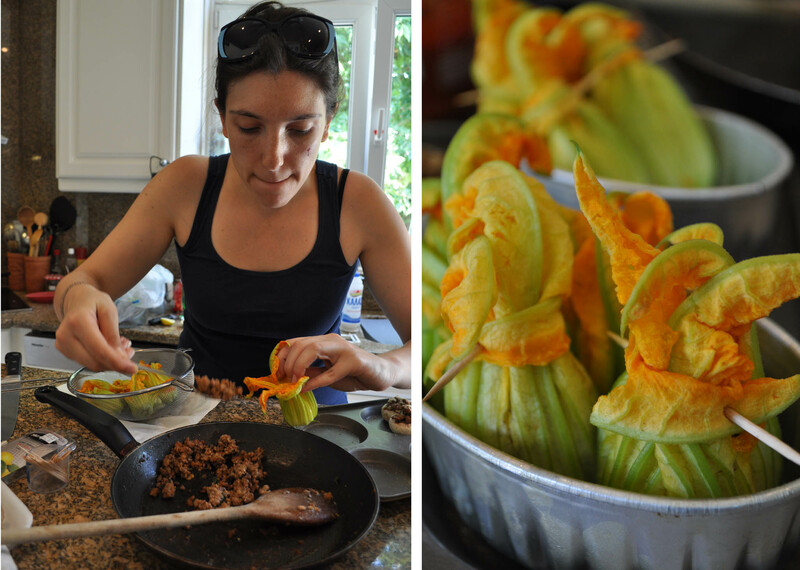 Looking around me and at the ingredients that were going to go in my dumplings, I realized that I had a lot more mushroom than I needed as well as my beautiful zucchini blossoms. I quickly realized that both mushroom caps and the blossoms made for great receptacles, and the mushroom caps from their end would really benefit and augment the flavours from their stuffings’ contents. And so I was off to make my non-dumpling dumplings. Combine chicken with sesame oil, juice of 2 limes, ginger, garlic. 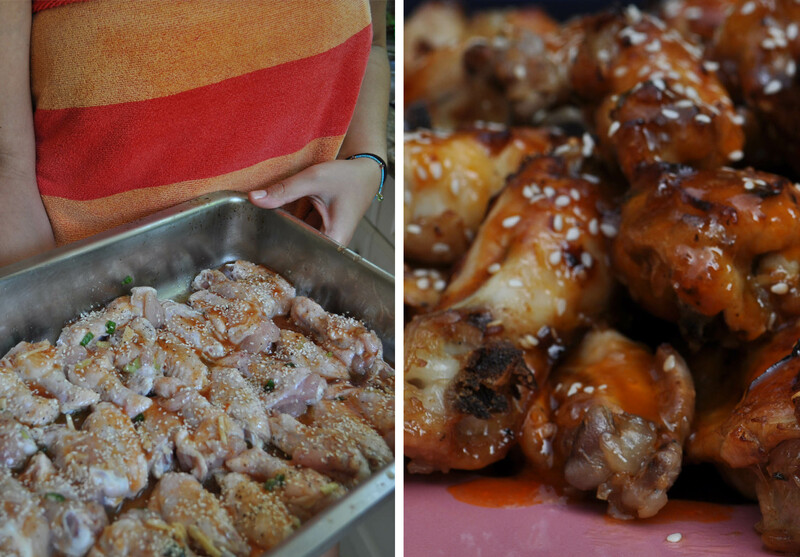 Lay the wings one next to the other, sprinkle with 1 tbsp sesame seeds and bake for 15 minutes. Remove juice from baking dish, pouring it into a sauce pan. Turn wings and bake for another 10 minutes, or until evenly and thoroughly cooked. In a sauce pan, add chili, ketchup and brown sugar to the juices from the baking dish, and simmer over medium heat until the sauce thickens. Arrange the wings in a serving dish and pour the thickened sauce over them. Garnish with the remaining sesame seeds and serve immediately. Heat a frying pan, and cook the minced pork meat. Once it starts browning, add the mushroom stems and minced garlic to the meat. Cook for 5 minutes, then add the soy sauce and spring onions. Cook for another 2 minutes. Place mushroom caps in a small cupcake pan, using it to stabilize them so they do not spill their contents, and start filling them. Once they are all filled, sprinkle with breadcrumbs on top, and bake for 15 minutes. Serve immediately with hoisin or peanut sauce. Carefully rinse each blossom, taking care not to rip them, because you want to keep all the juices inside. Once dry, start stuffing each one with about 2 tsp stuffing. Take the longest (or ugliest) of the “petals” and wrap it around the remaining petals, closing the “dumpling”, making a little parcel. Pass a toothpick from one side to the other of the “ribbon”, to secure the ribbon into place. Find a small tin where a bunch of these parcels can be stood next to each other, to provide support. Bake for 15 minutes and serve immediately with hoisin or peanut sauce. Yummy even though I cannot eat most of what you prepared it does look scrumptious! I have a weak spot for chicken wings. Any chicken wings. I’ll be making these this week. Welcome Irfan! Great to see you as one of our followers! Hi Irfan!! Please let me know how they come out! Post a recipe in the comment box or submit one so that we can try it and post it. Email us @fetaarepa@gmail.com.